Earn a certificate in how to Master Thyroid Disorders from the Hedberg Institute. Thyroid disorders such as hypothyroidism, Hashimoto’s disease and Graves’ disease are widespread affecting millions of people worldwide. A functional medicine approach to these conditions provides answers and solutions to patients who haven’t been helped by conventional medicine. Practitioners will develop a thorough understanding of the best tests for thyroid disorders and how to interpret the results. Additionally, practitioners will learn all of Dr. Hedberg’s exact protocols for addressing all possible causes of thyroid dysfunction. The connection between all of the body systems and thyroid disorders are covered in detail. At the end of this course you’ll have all the tools you need to comfortably and confidently address all patients with thyroid disorders. Recommended Prerequisite Course: Functional Medicine Fundamentals is recommended because practitioners must know how to treat GI and adrenal disorders for example to adequately address thyroid disorders. 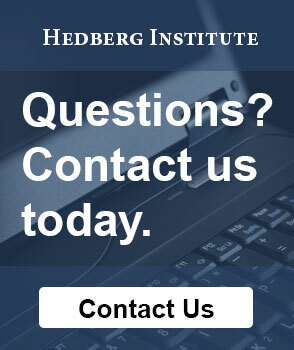 Print the PDF Certificate of Completion at the end of your Hedberg Institute course.